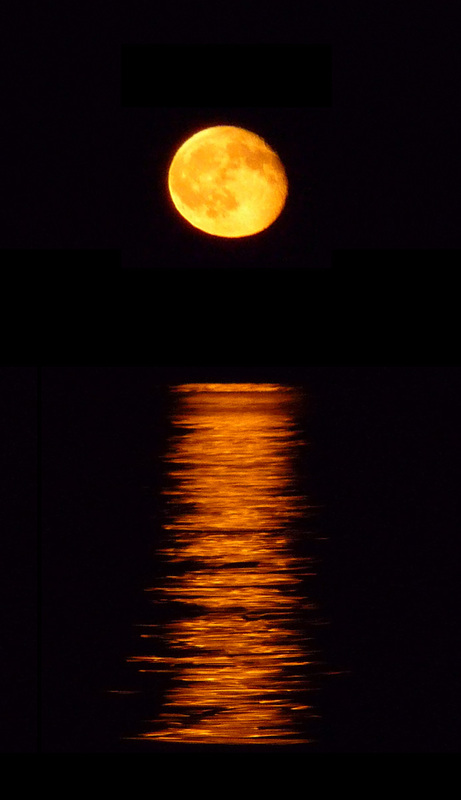 For me, the most wonderful hour of the year is watching a gibbous moon climb out of the sea on a July night in our favorite spot in Maine. "Bring me here when I'm dying," I told Mary. This picture is fresh evidence of the quality of my new camera. I made it with a hand-held instrument that fits into my pocket and weighs less than eight ounces. Besides the dark "seas" and some of the craters on the moon (near its upper-right edge), the photo shows the slight flattening of the lunar disk from atmospheric refraction. Don't count on getting this performance from every shot, however. To capture this one, I made more than 450 exposures. All but a handful were either fuzzy, poorly framed, or over- or underexposed. .